Beto O’Rourke spoke Tuesday during a stop at Keene State College. 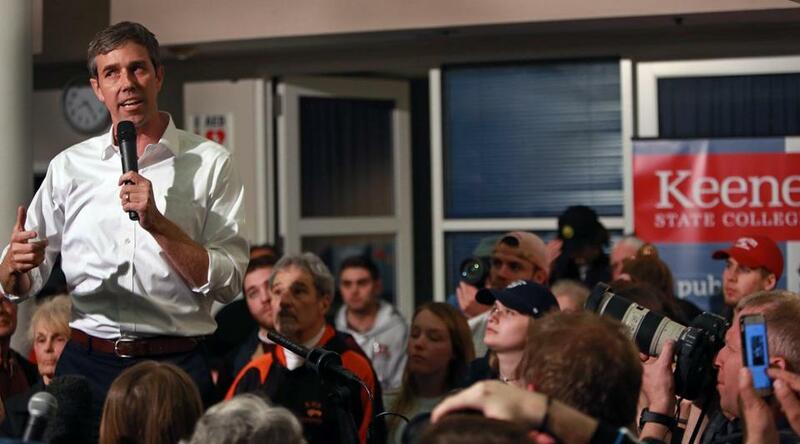 PORTSMOUTH, N.H. — Beto O’Rourke campaigned for the first time in New Hampshire this week, and the first-in-the-nation primary hasn’t seen anything like it. In less than 48 hours, O’Rourke held at least 10 events and took hundreds of questions from fans, critics, and the media. When most candidates or potential candidates go to Iowa or New Hampshire, they typically make a couple stops at either a big party dinner, college campus, political rally, or house party. Not Beto: His style, much like how he campaigned for Senate in Texas, is akin to political flash mob. Through e-mail and social media, the campaign announces it is showing up at a small restaurant or a student union. There are no volunteers directing people where to go or how to sign up as supporters. Rarely does a local politician introduce O’Rourke, and nobody plays campaign theme music to pump up the crowd. There are no campaign signs or podiums. Stop me if you’ve heard this one before, but the candidate has been known to jump on a table to talk to the crowd. The campaign’s social media savvy is unprecedented. This cycle, campaign operations are on the prowl for digital content with the candidate aimed at a viral moment that can bring in low dollar contributions. For example, Senator Cory Booker will happily woo local activists in a private meeting, but he’d much prefer they post video about their meeting to their social media feeds. Now consider how O’Rourke constructed his public events in New Hampshire: Each stop is intended to be three social media events in one. In Portsmouth and Manchester on Thursday, O’Rourke picked small, popular restaurants downtown and near a parking garage. Even though 100 people showed up to both events — about the same crowd size as for other candidates at similar stops — there wasn’t enough room to let everyone inside. Outside, O’Rourke gave roughly five minutes of remarks — just long enough for everyone to whip out their phones and take a picture of him, displaying a moment that appeared buzzworthy and like he was on the hustings. When O’Rourke went inside for a longer speech and question session, the different — yet still informal — backdrop provided another opportunity for social media photos. Finally, it’s time for selfies. Other candidates, like Senator Elizabeth Warren, are also pros at reserving time for such shots with supporters. But with O’Rourke, the selfie line feels like the main event. In Portsmouth, the line was organized quickly by staff and stretched past the full length of the building outside. His arrival is part-Obama, part-Trump. No doubt about it: O’Rourke is a celebrity. A group of high school girls in Manchester told me that they skipped school and created handmade signs to meet the pop star, er, former congressman and one-time El Paso councilman. The buzz surrounding his first trip to New Hampshire resembled those of Barack Obama and Donald Trump. People wanted to see the celebrity — and, as a result, guests appear more interested in getting a picture with O’Rourke and watching him speak, perhaps more than listening to what he said. In Manchester, the flash mob basically shut down a one-way street for several minutes. The last candidate to shut down a New Hampshire street like that this early in the primary? Donald Trump. The style is the message. It’s clear that O’Rourke’s relentless schedule and the controlled chaos that follows are part of the message he is trying to convey to voters just as much as any of his policy positions. Is O’Rourke, 46, underscoring his youth with so many stops? When asked by a reporter about this, he didn’t explicitly say there might be some older candidates in the race who can’t keep up with his pace. But later he did allow that his style is a part of this campaign message. A throwback to traditional N.H. primary campaigning. O’Rourke’s social media moment making is innovative, but how he is executing his New Hampshire campaign might be refreshing to traditionalists as well. In 2008, Barack Obama and Hillary Clinton changed the primary with packed rallies at high school gymnasiums, eschewing the more typical retail stops and house parties. Trump mastered the shock-and-awe in his bid, and now Bernie Sanders is the one holding large rallies. But O’Rourke is campaigning in the style of Jimmy Carter in 1976, Gary Hart in 1984, or Bill Clinton in 1992. They crossed the state, hitting country stores, malls, and bowling allies to meet people and “spontaneously” take their questions. Indeed, it wasn’t lost on some that O’Rourke’s event in Manchester was literally across the small street from where Ed Muskie jumped on a flat bed truck in the heat of the 1972 primary to hold a spontaneous rally where he may or may not have shed a tear.